I really love to crochet. 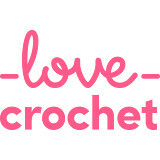 I was taught the (US) single and double crochet stitches when I was a child, maybe nine years old, by my mother. She didn't crochet much while I was growing up, but she knew how to do it and had made blankets in the past. I crocheted on and off for years, always wanting to learn more advanced techniques, but I never had the patience to learn until fairly recently. About a year ago, I was making small crocheted doll blankets in repeated rows of double crochet for my daughter. I found it calming. I posted about it on Facebook, and expressed my desire to get better at this craft. A friend suggested that I take a look at the Attic 24 blog for inspiration. I had a peek at Lucy's blog that day and I was taken in immediately. 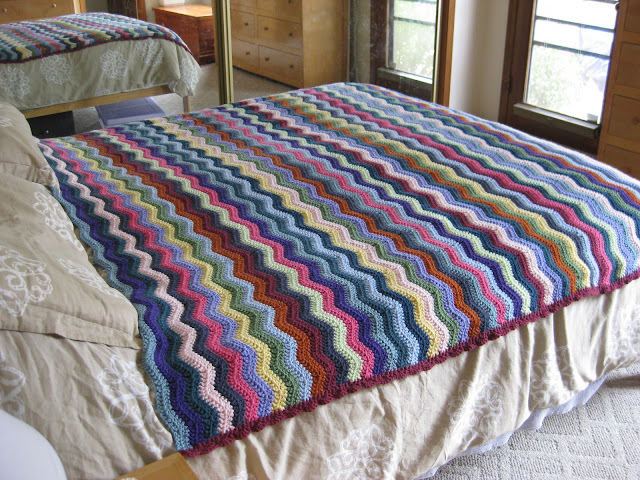 Her beautiful crochet projects, colorful photos and lovely home captivated my imagination. I spent weeks reading through every single post in the blog's archives. I just couldn't get enough. I realized that Lucy was doing what I needed to do: appreciating and celebrating her life as a wife, mother and homemaker, taking pleasure and finding joy in even the simplest of things. I have never met Lucy, but I think of her as a friend. I hope she understands that her blog has given me a lot of confidence in myself and in the things I find important. She makes me want to live a better life and be more appreciative of everything I have. She also helps me strive for more, especially through learning how to do things myself, to beautify my home, make it more comfortable and give it a personal touch. I know that many people share my feelings. I am also a member of a Ravelry group devoted to fans of Lucy and her work, and a fan of Lucy's own page on Facebook. I recommend both to those looking for daily inspiration, crafty and otherwise. So I picked up my hook and decided to learn from Lucy. Her blog contains wonderful tutorials written in a simple way. Anyone can learn to crochet from tutorials like this. My first Lucy-inspired project was an afghan using her Neat Ripple Pattern. This was the biggest, most advanced crochet project I'd ever attempted. It took me awhile to get the hang of the pattern (especially the 2DC decrease stitch which makes the "valley" of the ripple) but I spent a Sunday morning practicing with scrap yarn and I finally got the hang of it. I made an afghan to fit my queen-sized bed in just over a month. I am so proud of this project. You can see a little bit of it above in my banner photo but here's another photo on the bed. I went on to make several other projects from Lucy's blog, including a Granny Stripe afghan and a Crocheted bag to keep my yarn in while I work on a project (I actually made two of these, a big one for me and a smaller, fabric-lined one for my GB, to use when she goes to her ballet class). I have several other Lucy projects lined up for the future. Through reading Lucy's blog I have become quite the blog fan. I had never really delved into the world of crafty blogs before I read hers but I have so enjoyed making blog-reading a part of my daily life. I have a number of favorites from which I receive lots of inspiration for crafting, homemaking, cooking, baking and more. Currently, I am crocheting a "giant granny square" afghan. 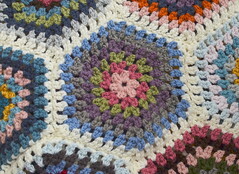 I am using this tutorial, Granny square, from the Bunny Mummy blog. 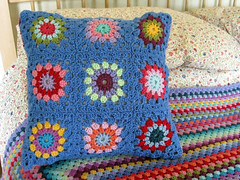 Jacquie makes granny squares so simple. I was originally planning to make lots of small ones and crochet them together but I liked her giant granny afghans on the blog so I decided to just keep going. This afghan is also meant for our bed and because it's a square it needs to be quite large to reach from side to side in that square-shaped area below the pillow shams. Right now, it's about four and a half feet wide and I'm really almost done. I think I'll do another 6 or 7 rounds and add a border, and call it good. This is how it looked about ten days ago, the last time I photographed it. I'm going to need the Bear's help, and his superior photography skills, to photograph it when it's complete. This is a Jacquie-inspired project but the yarn is definitely Lucy. For this afghan I am using the most wonderful yarn, Stylecraft Special DK. I buy it online from Deramore's (the company in the link). I love the yarn and I love Deramore's. They are a UK company, but they will ship for free to the US if you spend $50 on their site. That is very easy to do when you love yarn. This yarn is 100% acrylic, imported from Turkey, and it is so soft and lovely to work with. Deramore's actually sells something known colloquially as a "Lucy Pack"; this is a package of 17 different colors of Stylecraft Special DK yarn inspired by Lucy's work. You can find it by searching on their site. It's very affordable, plentiful (each skein is nearly 400 yards!) and I feel like it takes the guesswork out of buying yarn online, where it's hard to determine exact shades. This is DK (double-knit)-weight yarn, and I'm using a 4.0 mm hook with it. I have really enjoyed working on this project, even though I am starting to feel a little bit antsy about getting it done so I can move onto something different. The process of creating a granny square is so relaxing. It's just the same thing repeated over and over in round after round, until it's big enough for your liking. I find the repetition very soothing, especially at the end of the day. For the edging, I plan to use another tutorial from Jacquie, the Double V edging pattern. The giant granny is in its final stages now so I am planning the next project. It's going to be something wearable, for the GB! I have made hats before but never actual clothing. I already bought the pattern. I hope to talk about it some more very soon. It's almost the new year and I want to start writing about my life, my family and my hobbies. I have tried blogging before and didn't stick to it very well. Maybe I can change that; a new year's resolution, if you will. My name is Jennifer but you can call me Thistle; a lot of people do. It's four days after Christmas and I'm sitting in my sunny family room, facing windows which give an eastern view. I can see the Sandia Peak from here. I'm lucky, and thankful. I have a wonderful husband, lovely children and a comfortable home. I got some fun things for Christmas but I already had everything I wanted. I try to be optimistic. I try to look on the bright side whenever possible. I try not to complain. I think I have a lot to look forward to. Homemaking is very important to me, mothering even more so. I like to craft, especially crocheting and sewing. There are always multiple projects swirling through my brain and I need to get them out. I dream of colorful yarn and cloth and needles and pins. I read cookbooks like they are novels. I live in a pueblo-style house in an urban subdivision. Think stucco, vigas and xeriscaping. It's important to me to have flowers in my house. I love old things and new things that try to look like old things. I have a boy and a girl, ages seven and four, respectively. They are loud, messy and inquisitive. They are perfectly mine. They are the Little Bear (LB) and the Girl Bear (GB). I am married to a really terrific person. He is the Bear and he is my heart. There is so much more to tell you. I will probably start with things I am making. I have always made things, starting when I was a little girl, but in the past year I have found salvation, self-respect, courage and confidence in making things and it has changed my life.